Lubricant analysis is a new service option available to RVers now. Many large vehicle fleet operators have taken advantage of this service and they have enjoyed more consistent maintenance costs and in many ways, lower maintenance costs. In addition they can take preventative and predictive action on an impending problem before the issue develops into a catastrophic and more expensive component failure. We met with Tom Johnson and Barney Gerdts from JG Lubricant Services last fall after talking and corresponding back and forth for almost one year prior to that. Tom’s background included many years with Allison Transmission where he oversaw the development of Allison’s TransSynd® synthetic transmission fluid which is the lubricant shipped in every RV Allison Automatic transmission since the mid 2000’s. His depth of knowledge is world class and when he retired he refocused his knowledge and expertise into the RV, Marine and smaller Fleet business. He had seen the benefits of Lubricant Analysis in his work and also in larger fleets. Since I make it my business to address RV Maintenance online and at Seminars, I wanted to undertake the analysis on my own coach and do some in depth study of the process before making any recommendations regarding it. By meeting with Tom and Barney I was able to get a better understanding of the people behind the analysis, the process itself and see the results firsthand. That procedure has been my approach to our blossoming RV business. 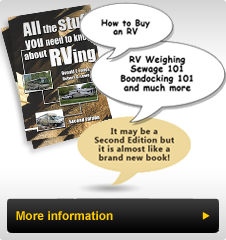 Try the products, check out the company and make knowledgeable recommendations to other RVers. To that end, we sampled my coach’s Engine oil, Transmission Fluid and Generator Oil. I was able to confirm that the transmission fluid was in fact TransSynd® (having had it changed a year earlier) and that there was nothing to be concerned about. The generator oil which had about 30 hours on it since being changed and it was still good for another season. The engine oil which they confirmed was Shell 15W40 Rotella T (new formulation) was good, although there was one anomaly: There was a moderate level of Titanium which the report indicated "may be alloy metal from ROLLING ELEMENT type BEARINGS, SHAFTS or as CONTAMINANT from COATINGS or PAINT”. Tom’s expertise lead him to suggest that it could also be break-in oil residue still in the crankcase. The mileage at the point of testing was 26,000 miles. He suggested running for another 5,000 miles and retesting. When we re-tested the number was almost zero, well under the warning level. It appears that his conclusion was correct. In this case, the results told us that there was no bearing or shaft deterioration. What would have been the outcome if I had changed the oil without analysis? In this particular case, there would not have been any problem. What if there had actually been some deterioration? The oil sample analysis would have allowed me to approach the engine manufacturer and develop a strategy to deal with the results prior to a major failure (and also while under warranty). The oil we discard can tell a lot about the condition of the engine from which it came, if we analyze it before discarding it. Let’s examine the background before going into more detail. While I could detail each areas I refer you to the JG Lubricant website at www.jglubricantservices.com where each area is covered in depth. As Tom says: For a RVer It’s the S.M.A.R.T.thing to do! Takes the guesswork out of Maintenance. In order to complete Oil and Fluid analysis, a sample is drawn from the appropriate fluid into a sterile container using a plastic single use tube attached to a small hand-sampling vacuum pump. This sample is sent to a lab where it is analyzed using sophisticated electronic and spectrographic equipment to medical laboratory standards and a detailed report is generated that includes the sample results and recommendations for any issues that appear and the next steps to take. These results are returned to you by email, within 24 to 48 hours of the lab reporting the results. The Test Kits include the sample container and packaging addressed to the lab in your area. There is some paperwork that needs to be completed regarding when the sample was taken, where it taken from (coach engine, generator, transmission etc. (Coolant analysis is also available)), mileage on the coach (or generator hours) how long in time and mileage since the last fluid and filter change and so on. The more accurate this information is, the better the predictive part of the process will be in analyzing the lab results. The RVer will need to acquire the small hand pumps (a one-time expense) for each type of fluid to be sampled and be careful to avoid contamination. These are available from JG Lubricant Services website (among others). Their website shows sampling videos together with detailed easy to follow directions. The kits are available in single and three sample packages and come in a plastic storage container for easy storage and to keep everything together. Can I save some money? The testing will save you money by safely extending your fluid change intervals and giving a better understanding of the condition of the component from which the fluid was drawn. Here is a way to save a little more: Use the coupon found on our Rally Special Flyer available at Rallies where we present seminars or go online to our website: www.RV-PartsPus.com and click on the Products Tab from our home page, scroll to the bottom and click to enlarge, print a copy, then use the code to save 10% off the sample kits. For more information go to the JG Lubricants website www.jglubricantservices.com to read more online.